For the remainder of the NBA season, The Triangle will be breaking down the biggest games of the week. Today’s edition: Heat-Thunder. It depends on which team we’re talking about. 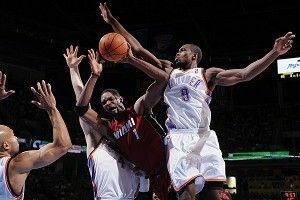 With about 1:30 left in the game, right after Serge Ibaka emphatically yanked down his 10th rebound, the cameras flashed to the Miami bench. Down 16, the Heat’s Big Three sat as Oklahoma City’s crunch-time lineup moved down the floor on offense. The Thunder starters would play just 22 seconds more, but the way Ibaka grabbed that rebound as LeBron James & Co. looked on seemed to fit with the game’s first 47 minutes. This one meant more to the Thunder. Miami came into Sunday night’s game the way they come into every game of the regular season — with nothing to gain. Since James’s decision to join the Heat, both he and the rest of his team have been placed in the curious position of having their regular-season successes discounted. James’s historically great 2012 campaign means nothing if it doesn’t carry over to the playoffs, and each Miami win comes with the expectation that it is supposed to happen. The Heat trail Chicago by 3 ½ games in the East, but with a repeat of last year’s Eastern Conference Finals (and its results) looming, it doesn’t matter. Miami is and will be the team to beat as long as Dwyane Wade and James are around; one game in March can’t change that. For Oklahoma City, Sunday night was a chance to prove that they don’t just belong in a conversation about a Finals preview, but one that frames the Thunder as a legitimate threat to James and the Heat. From Kendrick Perkins’s pregame comments about making a statement, to creating 21 turnovers, to the energy the Thunder brought to both ends of the floor, there was no mistaking that Oklahoma City wanted to send a message about what type of team it has turned into. Kevin Durant. Durant spent much of Sunday night doing his best LeBron James impersonation, and it was a sight that should terrify the rest of the league. With Russell Westbrook out with foul trouble for much of the first half, Durant controlled almost every element of the Oklahoma City offense, and he did so while being checked by the league’s best perimeter defender. There was no doubt when Durant came into the league that his abilities to score would present a wholly unique challenge to opposing defenses, and Sunday night was no exception. Whether it was a quick jump shot off a crossover near the top of the key or a pull-up 3 from 25 feet, Durant scored whenever and wherever he wanted, and finished the night with 28 points. I mentioned the guy guarding him was LeBron James, right? Even with the scoring display, the most encouraging part of Durant’s offensive game was the knack he showed for creating plays for teammates. On several occasions, Durant managed to beat James off the dribble near the top of the key and dish off to Perkins and Ibaka (who combined for 35 points on 16-of-21 shooting) for easy looks. At the end of two quarters, Durant had six assists in leading Oklahoma City to an 11-point lead. He finished with a season-high eight assists, and if Westbrook hadn’t spent much of the second half trying to make up for shots lost while he missed time with foul trouble, that number likely would have been higher. What doomed the Thunder against Dallas last postseason was their inability to create high-percentage shots when games got tight. Both Durant and Westbrook relied on mid-range jump shots that can’t sustain an offense down the stretch. If Durant can reliably create offense for teammates and James Harden continues his play on that end of the floor, the Thunder will have a combination of threats they didn’t have a year ago. Almost as impressive were Durant’s efforts on the defensive end. Along with having to facilitate most of his team’s offense, he drew the unenviable task of guarding James. LeBron finished with 17 points on just 8-for-18 from the floor and was forced into numerous difficult shots that only became tougher with Durant’s length. With what James has done so far this season, he is undoubtedly the league’s most valuable player, but Durant’s efforts on both ends of the floor last night were enough to show that he belongs in any conversation about who’s no. 2. 4-of-16 shooting for Russell Westbrook. Westbrook, by almost any measure, has been excellent all season. The fourth-year point guard is averaging 24 points per game with a true shooting percentage over 55. What was confusing (and troubling) about Westbrook’s game Sunday was his persistence and shot selection despite (a) his struggles, and (b) Durant’s hot hand. More than once during the second half, Westbrook, near the top of key, pounded the ball to the deck until the shot clock was down to a few seconds and followed with a desperation jumper that missed badly. Westbrook’s lack of conscience offensively is what allows him to be the player that can go off for 45 like he did against Minnesota on Friday, but it’s also what helped the Thunder jump-shoot their way out of the playoffs last season. The worry about there being only one ball in Oklahoma City isn’t new, but as Westbrook fires up contested 20-footers while a wide-open and hot-shooting Durant waves a hand over his head, it’s hard to ignore. When its offense is clicking, the Thunder is the most likely team to beat Miami in a seven-game series. The efficiency with which Oklahoma City scored Sunday probably won’t be duplicated when these teams meet again (Perkins’s 16 points were a season high, and Ibaka will run out of 8-of-10 performances from the field), but what OKC put together Sunday night is indicative of how it is a more potent threat than it was last season. With Harden a threat to score 20 every night, their typical dynamic scoring tandem, and Durant acting as a facilitator for the rest of the offense, this is a team that’s ready to win a title.